A crime is afoot! A shriek erupts into the air as the baker realizes a terrible truth. Some malicious figure stole the pot pie that he spent hours preparing and those foxes roaming around look awfully suspicious. There’s only one team of investigators that can correctly find the culprit and bring him to justice. Yes, the Chicken Investigators intend to capture the thief, but they’re going to need your help. This Outfoxed! Board Game is a cute game designed by Gamewright. It’s a cooperative game that puts you and your family into the roles of Chicken Investigators. You’ll need to search the field to find clues and accuse the right fox before he makes it back to his hideaway. 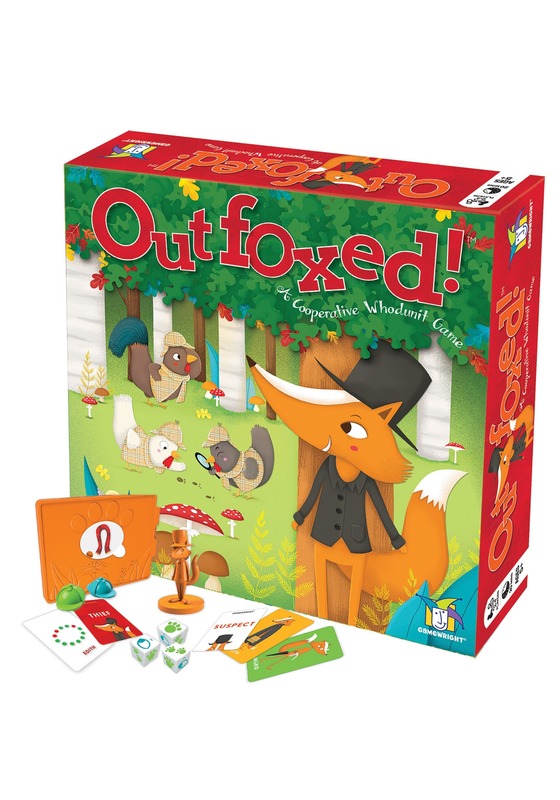 The game comes with suspect cards, their cards, clue markers, detective hat-shaped pawns, custom dice, a naughty fox figurine, and a game board. Gameplay is rather simple. Each player can choose to investigate or they can roll the dice to travel across the board. Investigating to find clues helps you figure out who the guilty party is, but you don’t want to spend too much time dawdling! The fox is on the move and if he makes it back to his foxhole, he wins the game!